Hybrid 3.0 comes with over 1,200 inspirational presets designed to jumpstart the creative process. Over 200 new patches, designed by the acclaimed AIR sound designers, include everything from wobbles, synth pads, arpeggios, poly synths, basses, leads, sequences, and much more. Hybrid veterans will be pleased to find that the familiar Hybrid 2.0 presets have been completely reworked, allowing users to experience their favorite sounds with all the sonic improvements of Hybrid 3.0. If you’re prone to tweaking, Hybrid 3.0 is loaded with a comprehensive set of user-adjustable parameters that let you create unique sounds and fine-tune them to taste. With support for two simultaneous parts (i.e. a powerful combination of two separate, 3-oscillator synthesizers), you can layer, split, or spread sounds to produce deep, complex, and wide patches. Plus, the simple patch browser makes it easy to find the preset you’re looking for and allows you to load two presets simultaneously, one into each part, for experimenting with rich timbres and playing multi-patch sounds. With three versatile oscillators and a sub oscillator per part, Hybrid 3.0 is capable of stacking multiple oscillators together for huge pads, leads, basses, and more. Two multifunctional oscillators can recreate the classic subtractive-synthesis waveforms for a dose of analog nostalgia. In addition, these oscillators feature algorithms for digital wavetables. 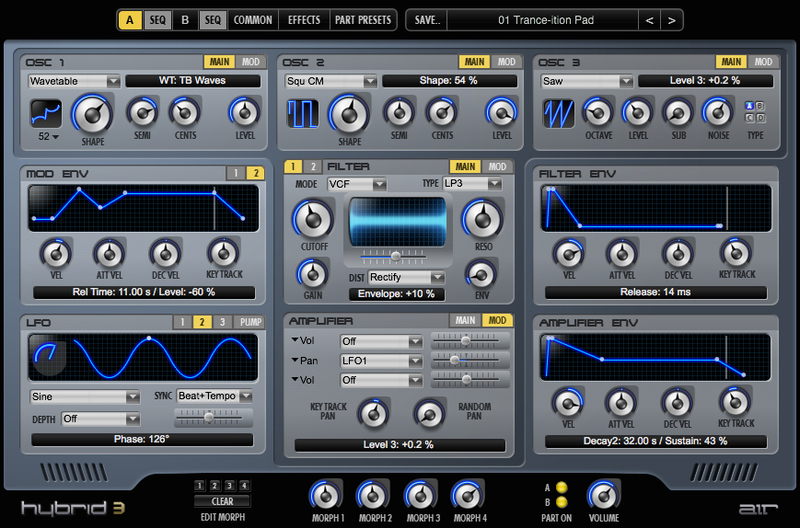 As a result, users can choose from nine different modes, including the Multi-Square waveform, Saw Sync, Saw Cross Modulation (which modulates the pitch of a saw wave with the output of a triangle wave for complex tones), Saw Multi (a stack of seven saws in unison), Square Sync, Square Cross Modulation, Square Pulse Width Modulation (PWM), and Wavetable. 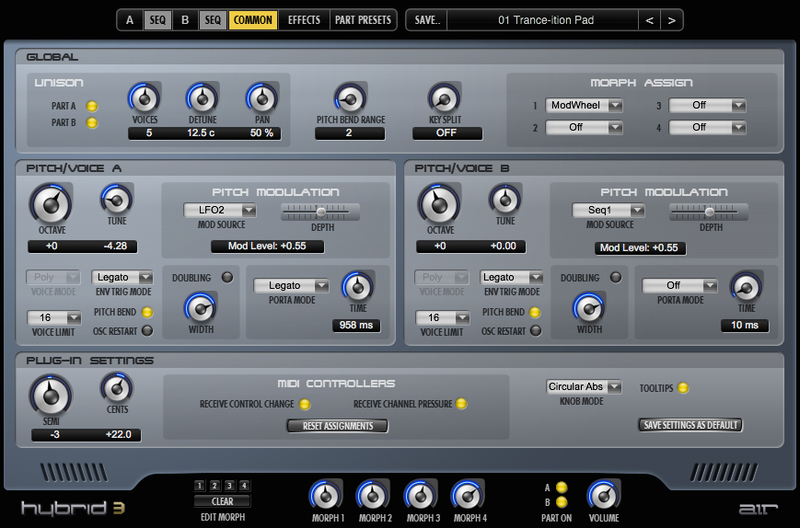 Hybrid 3.0 offers 100 wavetables with up to 64 single-cycle waveforms each. A third oscillator includes saw, square, or triangle waves, plus a noise generator and a sub oscillator for deep bass effects. Hybrid 3.0 features two multi-mode filters that can run in series or in parallel. In addition, the filters can be assigned one per channel to the stereo outputs, or set so that Oscillator 1 feeds Filter 1, with the remaining Oscillators being routed to Filter 2. Both of the filters offer your choice of DCF (Digitally Controlled Filter) or VCF models. The vintage Voltage Controlled Filter (VCF) makes it easier than ever to achieve those fat, retro synth sounds of the ’70s and ’80s. This sound filter brings the legendary soft and fat warmth of classic analog synth hardware filters to Hybrid 3.0. Use the revolutionary multimode filters to control the tone color of a part by removing or accenting certain frequencies. Choose from an extensive collection of 23 modes. Then dial in the filter cut-off, velocity, and key tracking. Use the resonance dial to change the tone from a nasal sound to a ringing tone by emphasizing frequencies around the cut-off and generating self-oscillation. A blend of the third oscillator and noise generator can serve as an audio modulation source for filter cut-off, producing distinctive electronic audio effects. To add some serious edge, adjust the filter saturation. Hybrid 3.0 offers the original Overdrive filter, which creates a soft tube-like clipping and includes five additional filter saturation modes: Distort, which creates a harder, brighter clipping; Hard Clip, which creates a very hard and bright transistor-like clipping; Rectify, which creates a gentle distortion that retains the character of the input signal; Bit Crush, which creates deliberate aliasing by reducing the bit depth; and Resample, which creates deliberate aliasing by reducing the sample rate. Hybrid 3.0 includes four LFOs per part: two monophonic, one polyphonic, and one special Pump LFO. Use the LFOs to modulate pitch, loudness, or cut-off to produce vibrato, tremolo, or electronic sweeps. Choose from eight modulation types, ranging from sine and triangle waves to random, “drift,” and sample-and-hold modulation. Change the depth, rate, phase, and sync mode to quickly and dramatically alter the sound. Pump is a special type of envelope that simulates studio side-chaining to create the pumping-and-breathing effect. In the case of Hybrid 3.0, this rhythmic effect can be applied to much more than the overall mix. The Pump LFO can be routed to create a rhythmic effect on a variety of specific parameters, such as pitch or filter settings. 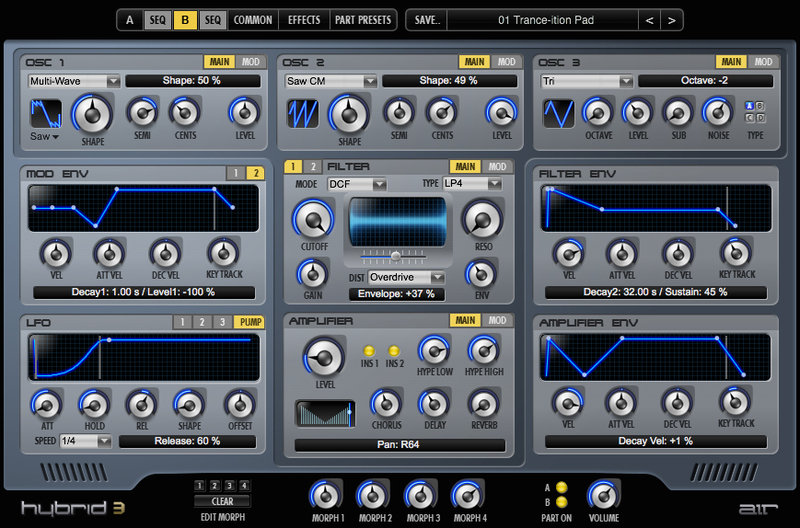 Use the four envelope editors to easily sculpt the filter, amplitude, and any two other modulation envelopes. Adjust velocity, attack, decay, and key tracking, and then type in the envelope rate. New to Hybrid 3.0 is Hype, a quick way of enhancing the low- or high- end of any patch. Beef up wobbles, basses, and kick-drum sounds with deep, sub-bass by adjusting the Hype Low parameter, or turn up Hype High to polish off the high end with shimmer and sparkle; the latter sounds great on pads, strings, brass, and percussive sounds. Hybrid 3.0 offers a new way of making your patches sound enormous. Two Doubling knobs, one for each part, are built into the Common tab for additional widening and thickening. Turn up the Doubling knobs to full for a dramatic response or mix it in subtly for a slight thickening effect. Whether you use it in the studio or in a live situation, Hybrid 3.0 is built to perform. 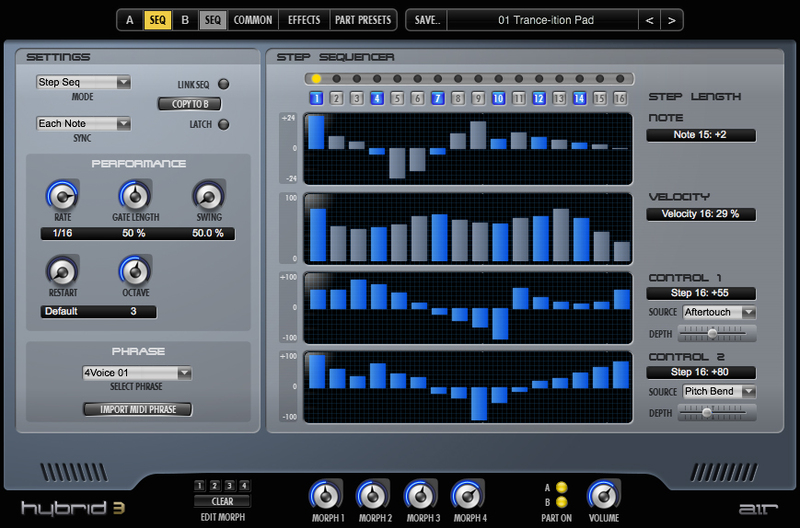 Use the step sequencers for arpeggiation or phrase generation. Set the modulation matrix to easily map modulations from sources to destinations. 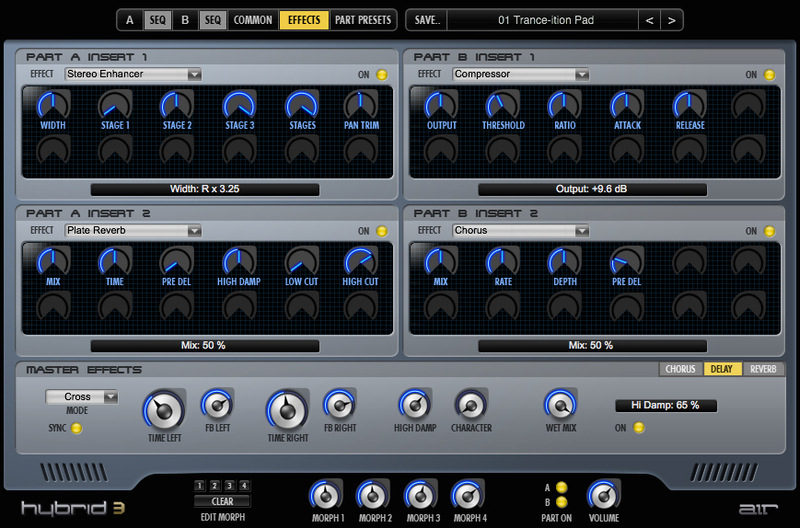 And set up “morph” groups to modify sounds on the fly, from the interface or a MIDI controller. Hybrid 3.0’s onboard 16-step sequencers have been revamped for more programming and sequencing flexibility. Now, steps can be linked together to vary sequencer rhythm, manipulate note dynamics, and create advanced modulation patterns. Like before, both step sequencers can function as a composition tool or an extra modulation source, making it easy to create patches that move and evolve. You can set note values, velocity, and modulation, and then pick from nine playback options to use the sequencer as a step sequence, arpeggiator, or MIDI phrase generator. 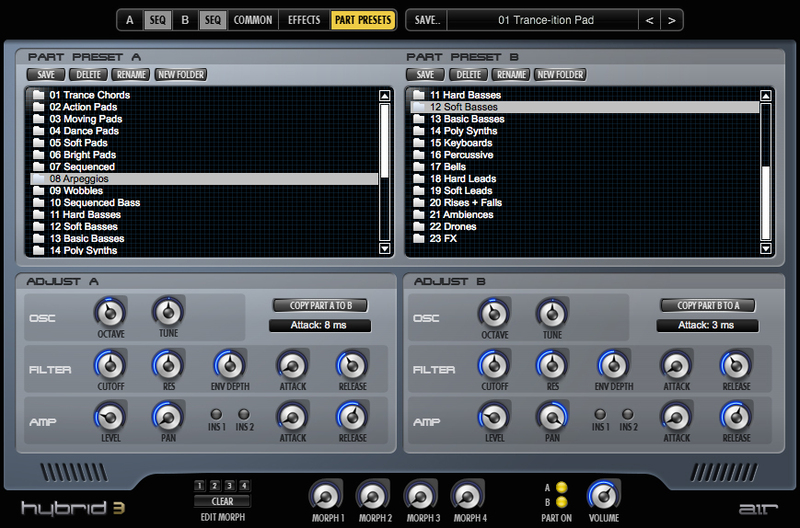 Plus, you can even import your own MIDI phrases for complete customization. Hybrid 3.0 also offers flexible and easy-to-use modulation matrices with 16 assignable modulation sources and more than 20 destinations each. Assign modulations to an oscillator or filter. Hybrid 3.0 allows multiple assignments of sources and destinations, all with adjustable intensities. With Hybrid 3.0, you can assign any rotary control or fader on the plugin’s interface to one of the four “morph” groups. Assign pan, filter, or amplifier envelopes to a morph group to alter sounds from your controller while recording or playing live. Each morph group can control several parameters simultaneously. You, in turn, can control morph groups from the dials on the interface or from a MIDI controller. Hybrid 3.0 provides two insert effect sends per part, each with more than 40 effect types, so you can quickly change the sound of a part. A separate master effects section lets you select reverb, delay, and chorus effects to enhance — or warp — any of the sounds at the patch level. Easily adjust effect parameters and sync effects to a chosen tempo. 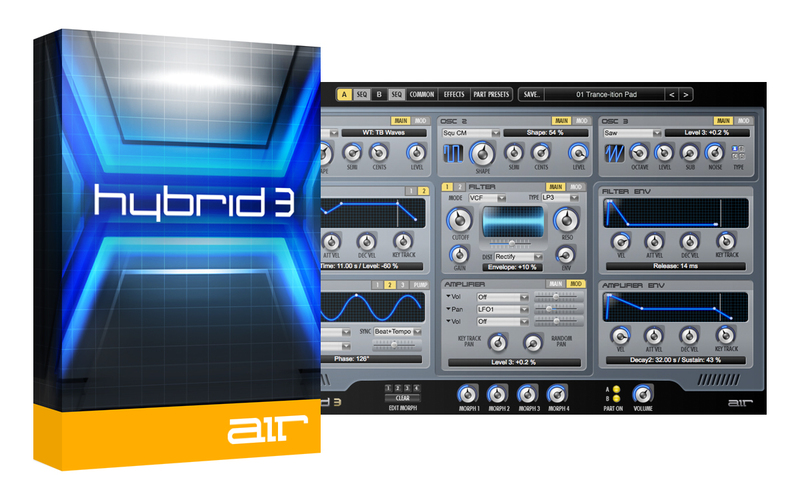 Hybrid 3.0 is available in VST and AAX plugin formats for both 32- and 64-bit operating systems and in AU for 64-bit operating systems. With its rich set of analog and digital sounds and a large array of adjustable parameters, Hybrid 3.0 gives musicians, arrangers, composers, and sound designers the qualities and character of a unique hardware synthesizer with the convenience and flexibility of an integrated plugin.